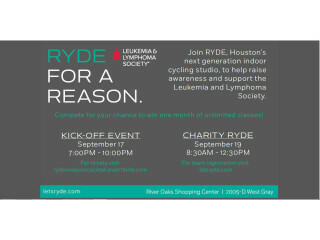 Recently opened indoor cycling studio, RYDE – River Oaks, is now accepting applications for 32 RYDE for a Reason team spots on September 19. Teams of up to four members must guarantee a minimum donation of $160, and each rider will receive an event T-shirt plus refreshments. Teams that raise the most sponsorship money for participating will be rewarded with a one-month, unlimited RYDE membership. The RYDE team is passionate about giving back to the community and excited to work with LLS, which counts a number of supporters as RYDE patrons. Marking September Blood Cancer Awareness Month, RYDE for a Reason will help raise much-needed funds for research, patient services and advocacy efforts. RYDE will host an in-studio cocktail party and silent auction to kick off the event on September 17. Admission includes a raffle, hors d’oeuvres from area venues, including Fleming’s Prime Steakhouse & Wine Bar - River Oaks, drinks and entertainment. $30 in advance and $40 at the door.